The laundry service at Chinook Regional Hospital (CRH) in Lethbridge is getting the job done faster than ever thanks to PulseFlow® Technology– and only sipping from the river and the power grid to do it. Until last summer when new equipment came on stream, the hospital used 30-year-old washers that consumed more energy and water than current models. Bob Corfield, director of linen services for the South Zone of Alberta Health Services (AHS) devised a compelling business plan highlighting what efficiencies could be achieved with a bit of investment. “(The new washers are) all because of Bob,” says Dave Kortt, manager of linen services in the South Zone. “I know that most people don't have a very clear picture of what actually happens down here. That's why I'm so happy to give a tour to anyone who's curious to come and take a look. It's a huge operation and it's pretty interesting to see how it all works. I want people to know they can trust the laundry system and they can count on good service from us” said Kortt. CRH serves about 60 outside clients, including the University of Lethbridge, physician offices and RCMP detachments. The laundry is a post-sort operation, meaning soiled linens are dumped into the washer en-masse and sorted later, when they emerge almost dry from the new machine's compression cycle. This is Alberta's only post-sort laundry and it produces 330,693 lb. (150,000 kg) of clean linens every month. Daily production is being met in less than eight hours and water usage has been reduced by 70 percent. To reduce energy consumption even further, the 30-year-old dryers are slated for replacement soon, too – but their energy usage has already dropped (25 percent shorter drying times) because the new washer removes so much more moisture from the wash. In addition to the new seven-module Milnor PulseFlow® Tunnel washer, the $2.4-million project included a waste-water heat reclamation system that reduces energy consumption by 50 percent, new stain-treat formulas that are helping to recover one- to two-tonnes of linens that would have been discarded in the past, and upgrades to the soil monorail loading system (an overhead tram that transports laundry bags to the hopper, where they're unloaded). A new ironer takes the nearly dry clean sheets and presses and folds them perfectly – in seconds. The changes have improved ergonomics for the department's 40 staff members as well, and allowed for working hours to be condensed into one shift from two. • Chinook Regional Hospital's new tunnel washer uses 50 percent less energy than the old washers and 70 percent less water. • The tunnel washer reduces dryer energy by 50 percent . • Laundry staff sort 1.2 million sheets a year and 4.3 million other items. • 1.3-million soaker pads, bath towels and patient gowns are processed every year. • The ironing station automatically irons, dries and folds 1.2 million sheets and flannels a year. • The new tunnel washer removes more water from the sheets and flannels, speeding up the ironing station by more than 30 percent. • In all, the laundry system handles 6.7 million items per year, weighing about 2.6 million lbs. (1.2 million kg). • Of those, 3.3 million are hand-folded, 1.3 million are machine-folded, and 1.2 million are ironed and folded. 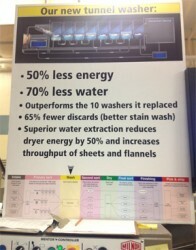 • Chinook Regional Hospital laundry serves 60 sites. • The machine washes at 155° F.
• Laundry services at Chinook Regional Hospital use about 525 gallons (2,000 liters) of cleaning chemicals per month.